IPPUDO started out in 1985 as a small ramen shop in Hakata, opened its first ramen shop abroad in New York in 2008, and now as of October 2015, has expanded to 53 ramen shops in 12 countries around the world. 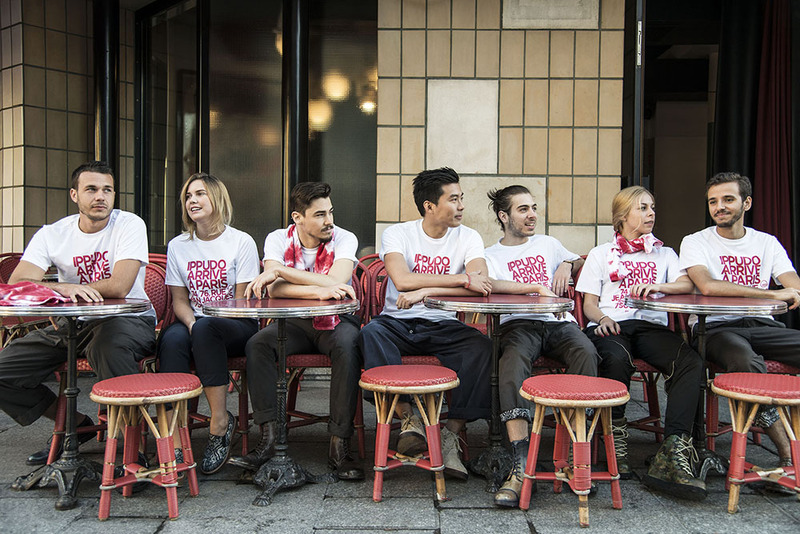 And now, IPPUDO is preparing to open a shop in the gourmet capital itself, Paris. 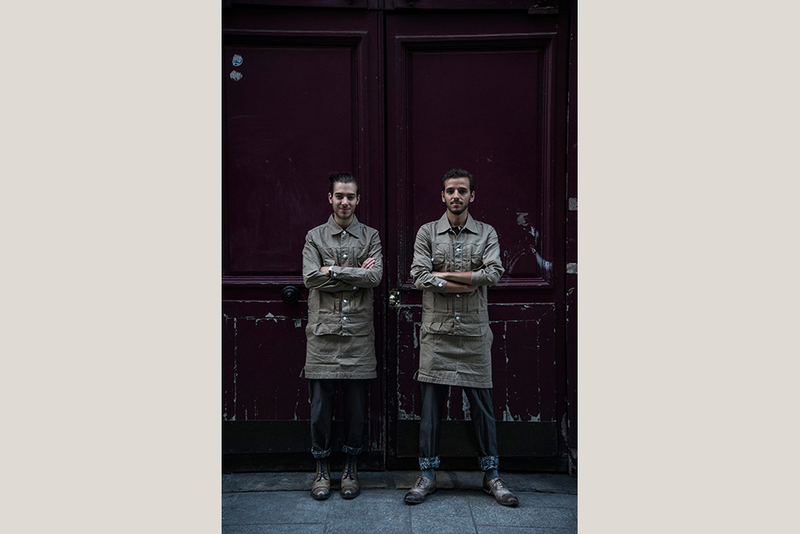 The shop is to open as a brasserie in the Les Halles district of central Paris – a district fondly known as the “people’s kitchen”. 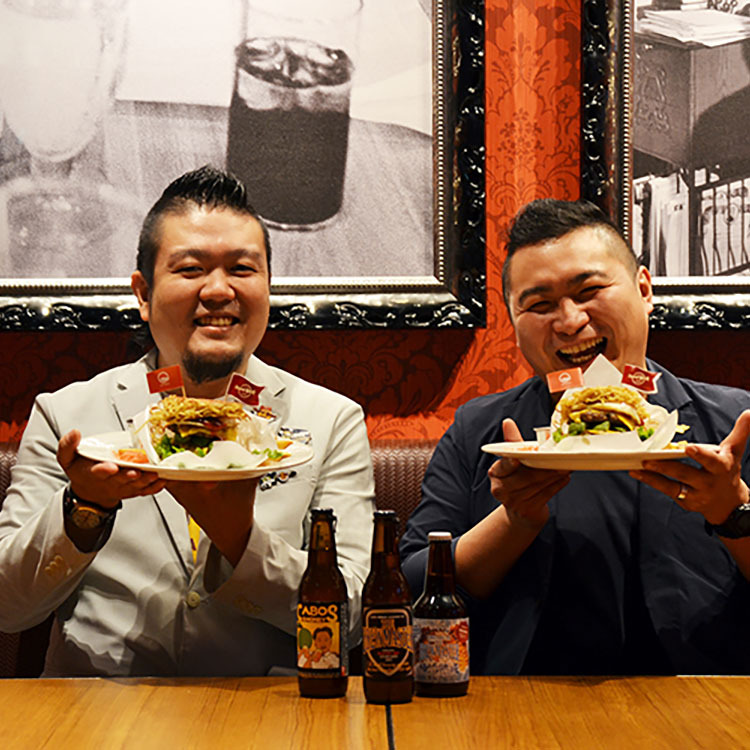 This particularly commemorative IPPUDO will serve not only ramen but a variety of food and drink, and IPPUDO has been giving it their all in the hopes of impressing the local foodies. 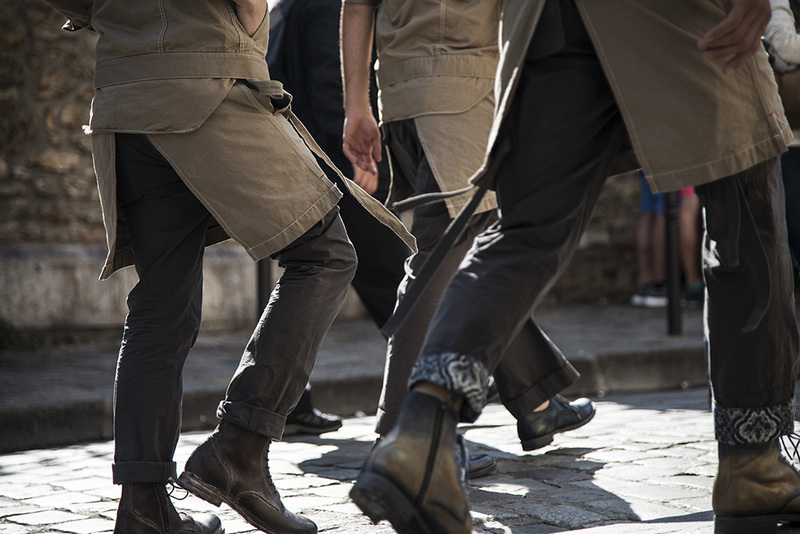 The design of the shop’s staff uniform was created by none other than MIHARA YASUHIRO, a designer based in Paris, and Mihara’s unique sense of fun can be seen scattered throughout. 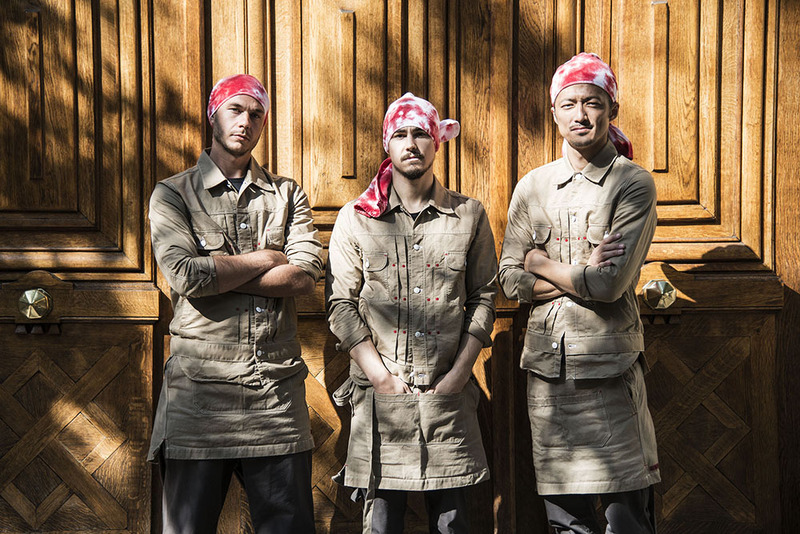 In 2014, the news that IPPUDO New York’s uniform had been designed by “ENGINEERED GARMENTS” wowed the fashionistas, and now a new fusion of fashion and ramen is to be unveiled in Paris. 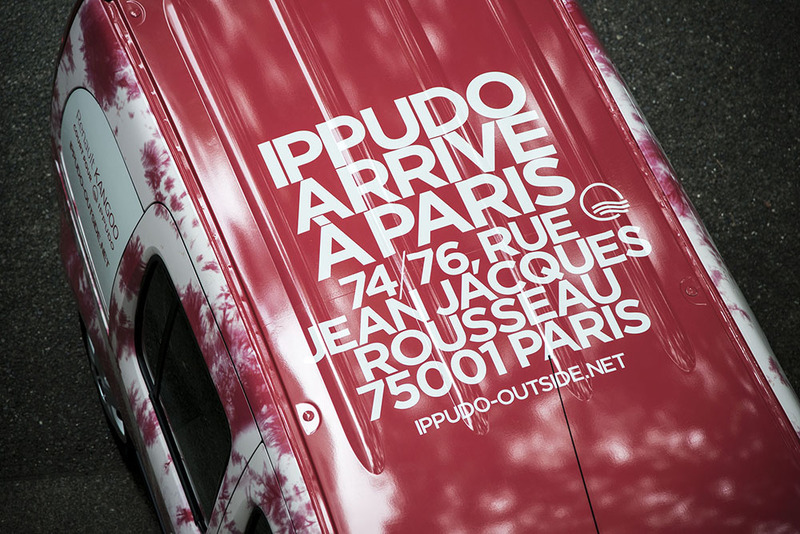 In addition, to commemorate the opening of the Paris shop, IPPUDO entered into a collaboration with a car manufacturer that epitomizes France, Renault. 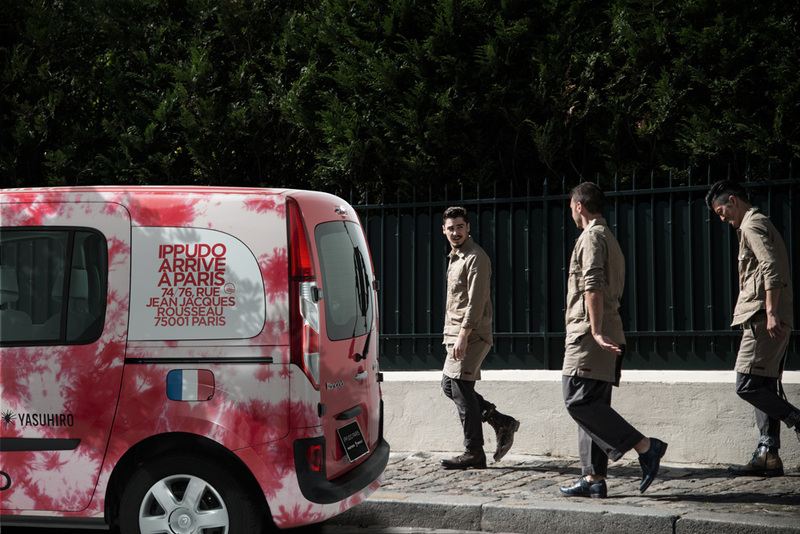 Among the many Renault car models, the “Renault Kangoo” affectionately referred to as “ludospace”（a playful space） owing to its spacious interior and high functionality was selected specially, and a one-of-a-kind IPPUDO custom wrapped car was created. 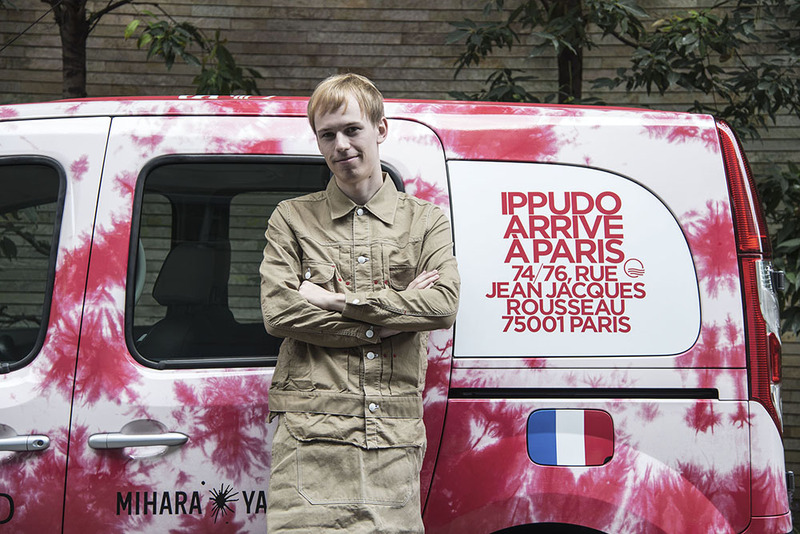 The design of the exterior displays the same tie-dye graphics incorporated into the Paris staff uniform designed by MIHARA YASUHIRO, and the typography used shows the address of the IPPUDO Paris shop. 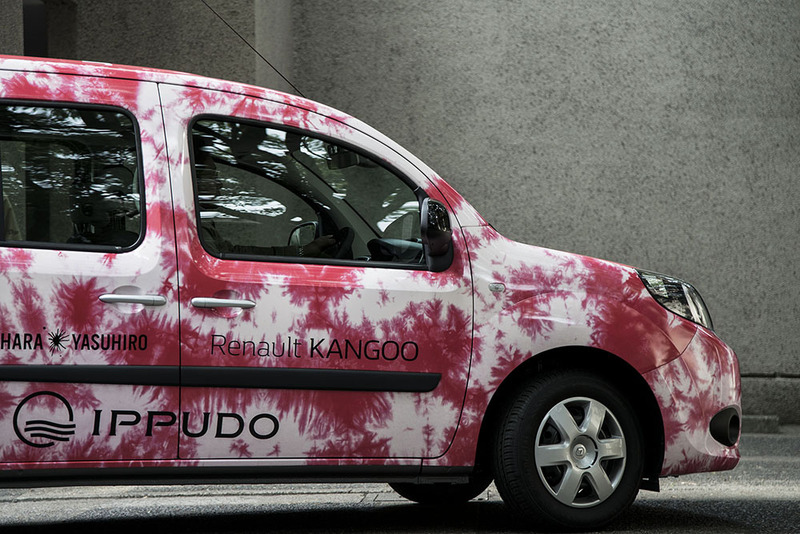 This one and only Kangoo, made through a special collaboration with Renault, was seen zipping around Tokyo prior to the opening of IPPUDO Paris. The IPPUDO OUTSIDE Editorial Department was able to interview MIHARA YASUHIRO, a key figure in this unique collaboration. 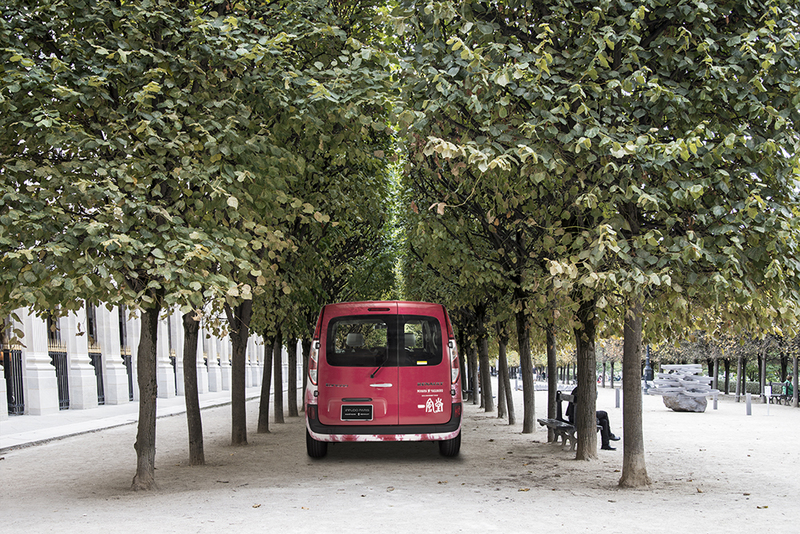 I will also be talking about the photo shoot which used Paris as its stage and the appeal of the Renault Kangoo. 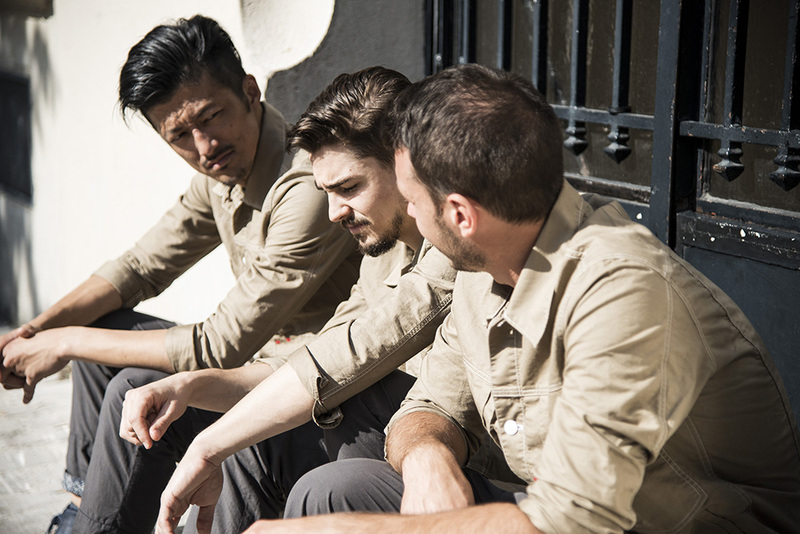 Interview with MIHARA YASUHIRO, the designer of the Paris shop staff uniform. first IPPUDO ramen shop in Paris was MIHARA YASUHIRO. We heard that you are virtually unrivalled in your love of ramen! And that although you were born in Nagasaki, you grew up in Fukuoka so can you tell us a bit about your impression of IPPUDO with its proud roots in Fukuoka prefecture? More than any other food, I get most comfort from eating tonkotsu ramen. I think this is because of my childhood memories of growing up in Fukuoka. 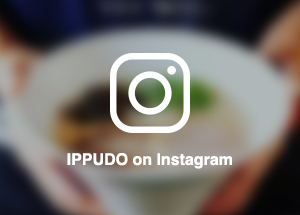 Although there are a lot of ramen shops in Fukuoka prefecture, I believe IPPUDO has created something of a revolution. 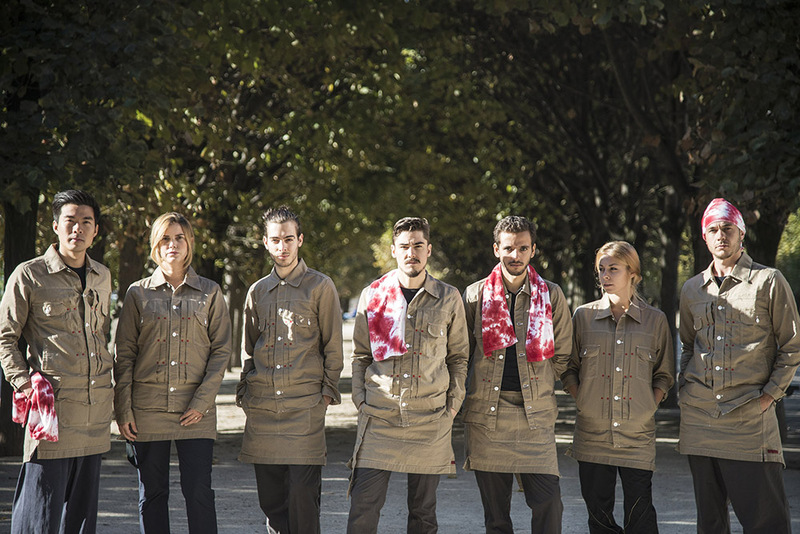 Your brand MIHARA YASUHIRO created the staff uniform for the first IPPUDO shop in Paris. 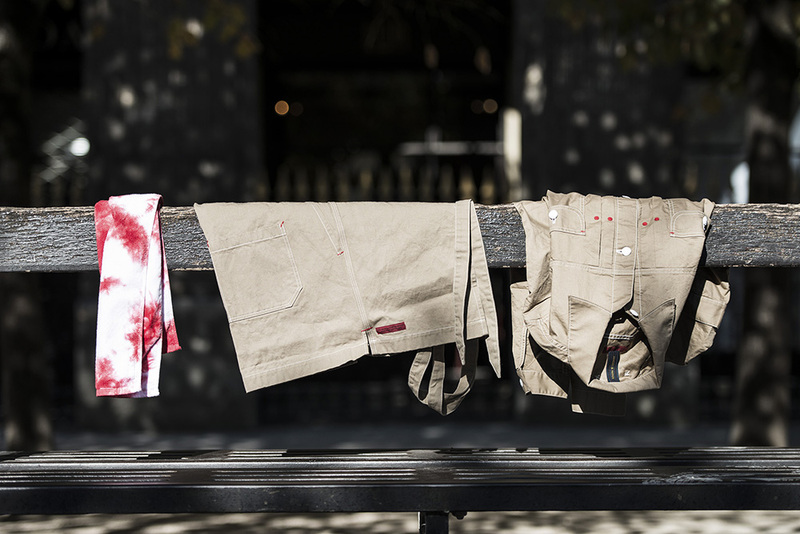 Can you tell us a bit about the circumstances leading up to you designing the uniform? Well, I heard that when IPPUDO decided to open their first shop in Paris, they chose me because I’m a Japanese designer who has experience of working on collections for Paris Fashion Week. I felt that I had something in common with IPPUDO in the sense that they stay true to the basics but are also committed to creating something fresh and new, and it was a great honor for me to be selected by IPPUDO, whom I admire for their no-compromise approach to ramen-making. It was through this collaboration that I came to understand their strong desire to spread IPPUDO’s ramen throughout the world. Can you tell us about the actual type of uniform that you produced and the overall concept you had in mind? Was there a difference between when you design a normal collection and when you were designing IPPUDO’s uniform, and if so, what was your main focus when coming up with the design? 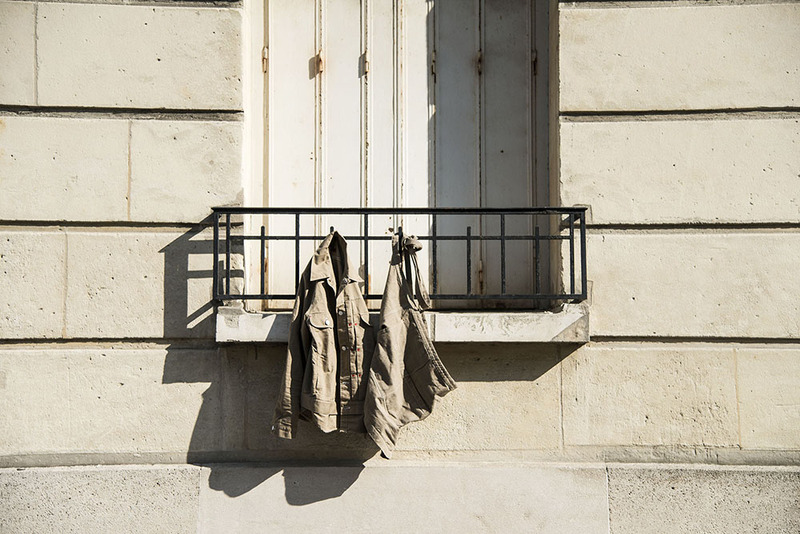 My take is that the streets of Paris retain a classical touch but also have a dramatic feel to them. 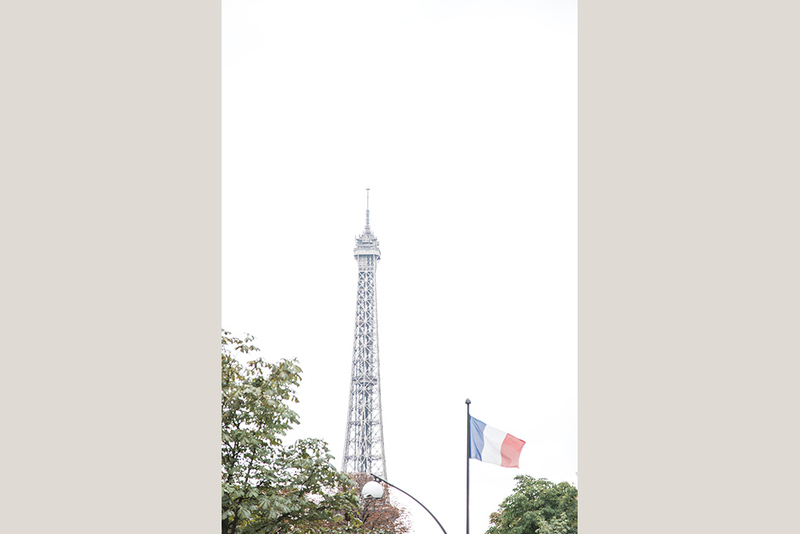 Whenever I go to Paris I feel like I want to live there. 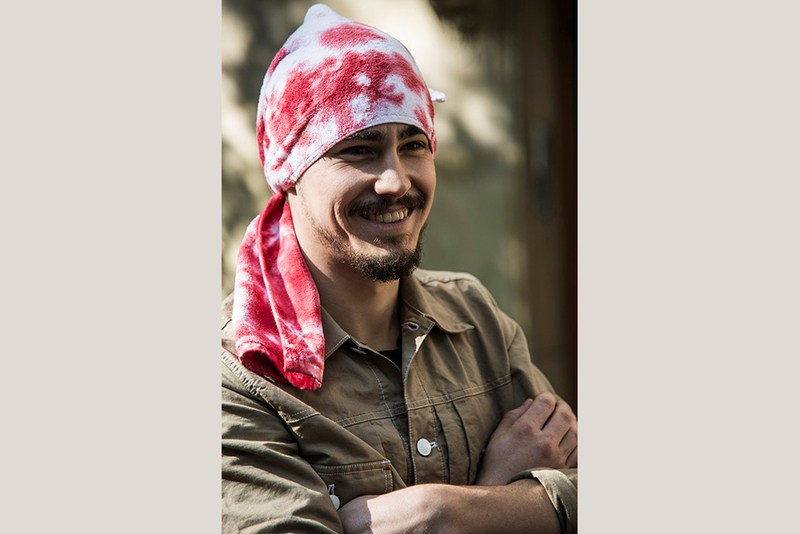 What I wanted to do was to bring a Japanese feel to the city of Paris and, in a good sense, an element of unfamiliarity, which is why I created a tie-dye bandanna. 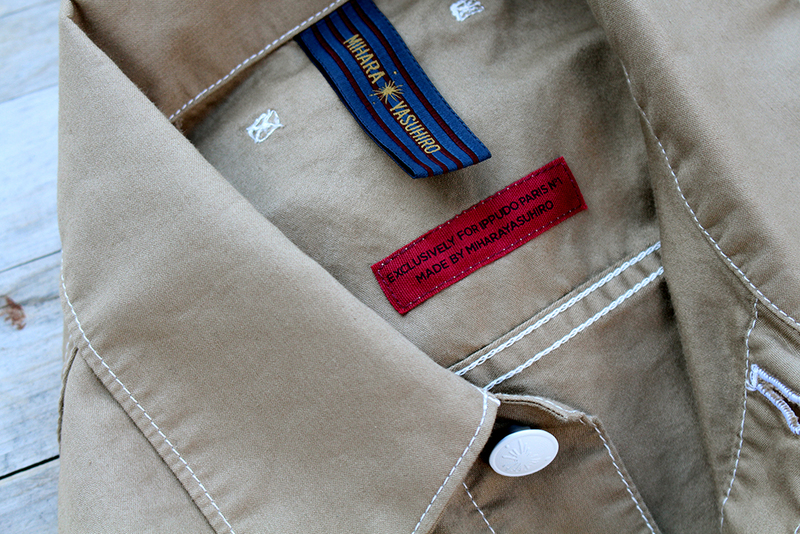 I chose beige as the primary color of the uniform since it matched the wood grain of the shop interior. Denim jackets have long been used as work wear, but by adding layered details to the shirts, I was able to put a new spin on the uniform to create a modern image of work wear. Another key point is the use of red in the finer details since it is the color most representative of IPPUDO’s image. 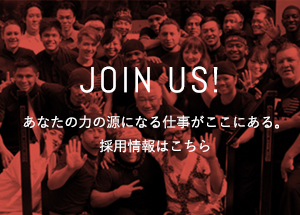 IPPUDO recently celebrated its 30th anniversary and the message it likes to convey is “to constantly change so as to never change” in the hopes of creating a future established brand. 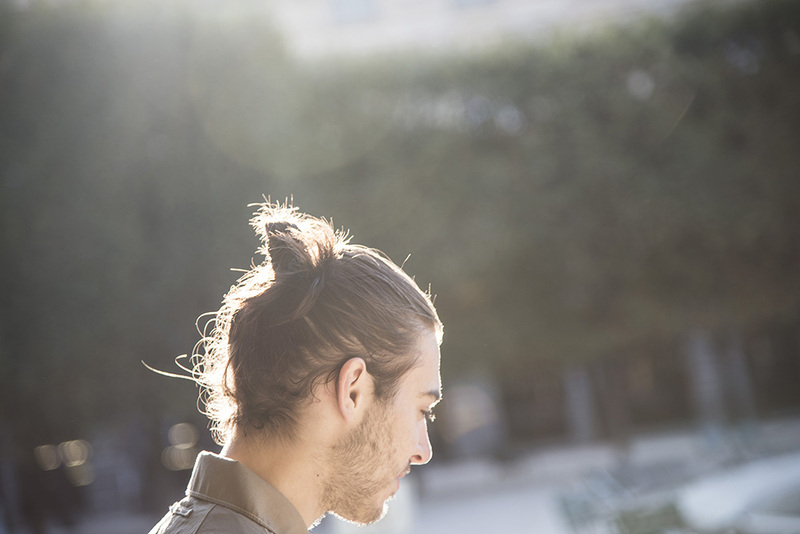 Can you tell us what this vision means to the MIHARA YASUHIRO name? The idea of becoming a future established brand is a concept which I myself am also deeply conscious of in continuing my own brand. In order to achieve this, I believe that we have to connect the work that we completed in the past with the work we plan to tackle in the future. Going forward, I hope to expand the MIHARA YASUHIRO brand throughout the world in order to achieve global recognition. 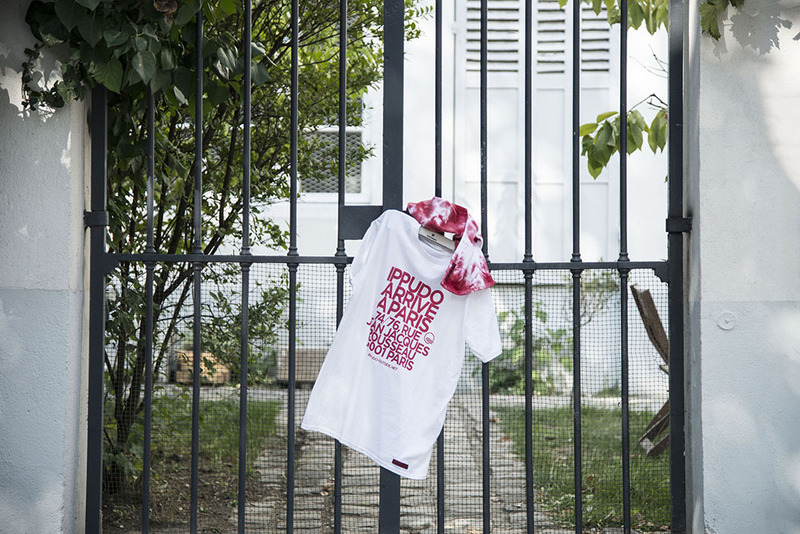 My hope is that not only customers who come to the Paris ramen shop but those who come to all of the shops in Japan will come to recognize our brand through this collaboration. MIHARA YASUHIRO Mihara Yasuhiro was born in 1972 in Nagasaki prefecture. He enrolled in the Department of Product and Textile Design of the Faculty of Art and Design of Tama Art University in 1993 and taught himself to make shoes while he was still a student in 1994. In 1996, backed by a shoe manufacturer, he launched “archi doom”. After graduating from university in 1997, Mihara renamed his brand “MIHARA YASUHIRO” which marked the start of his collection brand. In 1999, he established “Sosu” （meaning a prime number which cannot be divided but goes on to infinity）. 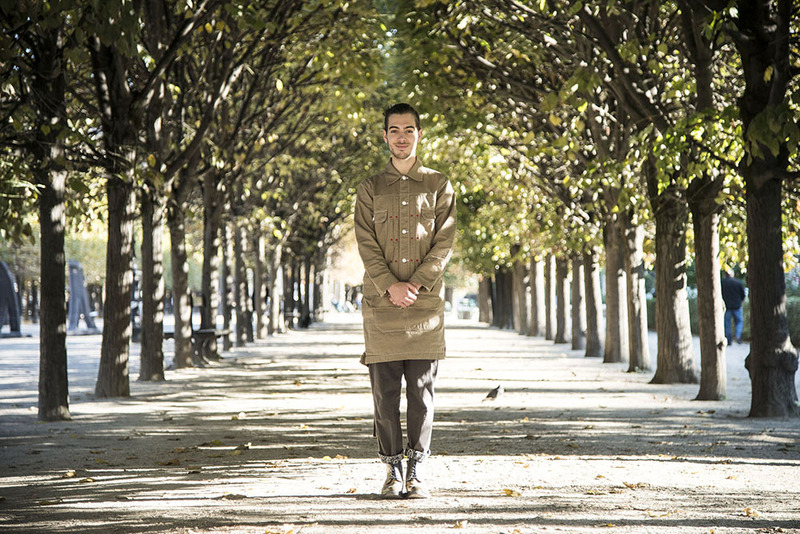 In the same year Mihara presented his clothing line at Tokyo Fashion Week, which attracted tremendous interest. Mihara took part in the Milan Fashion Week in 2004, and has been showing his works during Paris Fashion Week since 2007. Mihara Yasuhiro started his shoe brand as a designer in 1997. As well as thinking outside of the box and working on in-depth designs for his shoes, his work has attracted attention both in Japan and abroad thanks to his clothes which show off a playful theme. In 2000, through a collaboration with PUMA, he presented PUMA by MIHARA YASUHIRO. These collaboration sneakers were sold in countries all over the world, and as a result, the Mihara Yasuhiro became a global brand name. 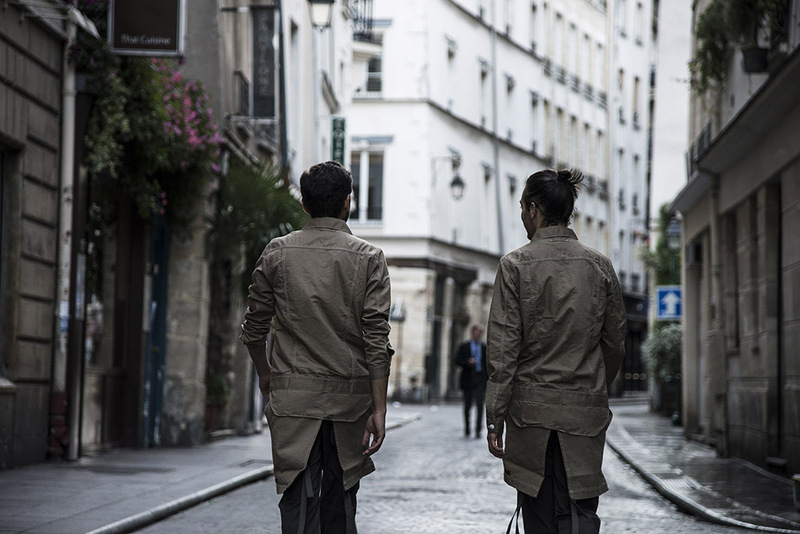 After presenting his line at Milan Fashion Week in 2006, Mihara has been presenting his line at Paris Fashion Week since 2007. In this collaboration there was another partner, Renault. If you walk around any town in France you’re bound to see a Renault – such is its status as a daily scene of life and, it goes without saying that Renault is a car manufacturer that epitomizes France. Renault cars are in great demand not only as passenger cars but also as commercial vehicles. 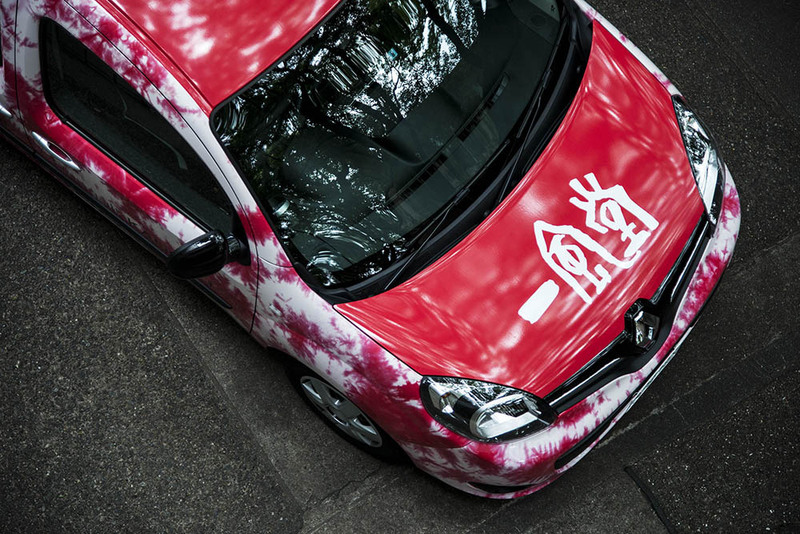 The Renault Kangoo, which is also highly popular in Japan, can be seen busily driving around town as a work car for the post office and flower shops. Renault so dearly loved by so many people in France. 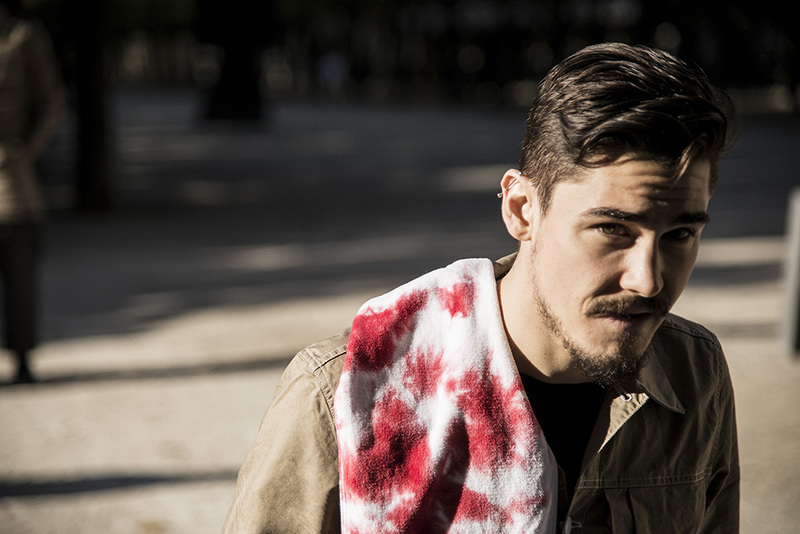 MIHARA YASUHIRO so active in the fashion world on the Paris stage. And IPPUDO spreading Japanese culture throughout the world with every single bowl of ramen. 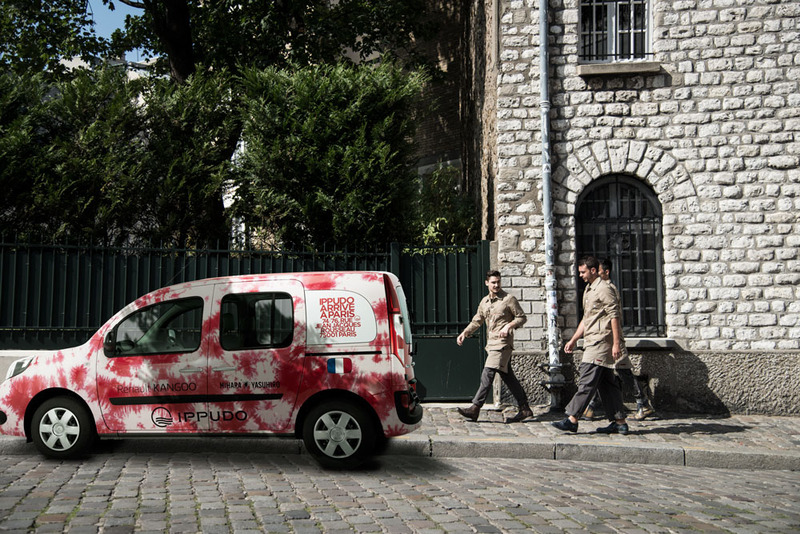 A collaboration involving these three companies gave birth to this very special one-of-a-kind Renault Kangoo. 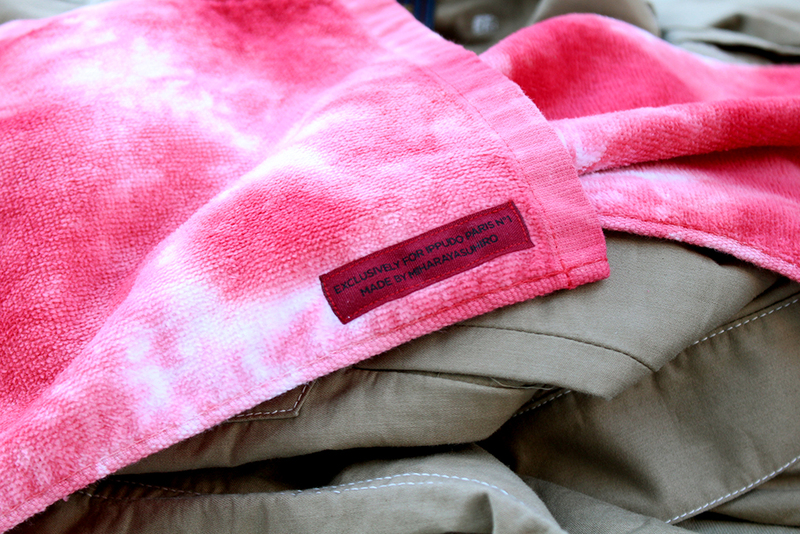 The exterior is decorated with a tie-dye pattern matching the towels styled as an accent in the Paris shop uniform. Other key points are the typography showing off the Paris address and the use of the tricolor of the French flag. 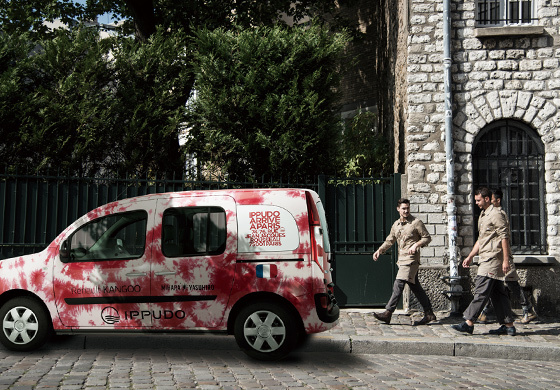 This specially built IPPUDO Renault Kangoo wasn’t just intended for the unveiling of the IPPUDO Paris shop to IPPUDO’s Japanese fans but is used by the IPPUDO staff to zip around town and can be seen, to this very day, breezing around the streets of Tokyo. 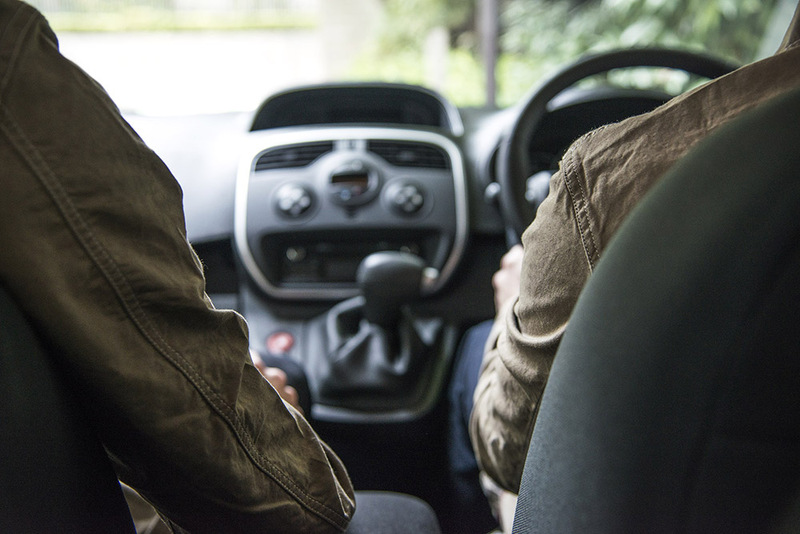 Since its birth in France in 1998, the Renault Kangoo has served the role of a commercial vehicle in Europe, and without losing sight of its original blessed qualities, it has continued to evolve. It is widely used for shopping, business, and as a vehicle for sports and leisure, with the sliding doors on both sides and double back doors serving so many purposes in various scenes. 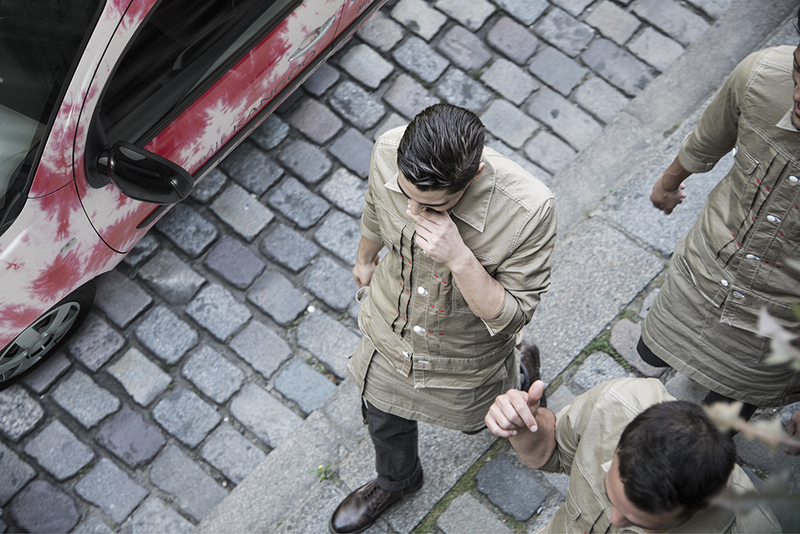 Moreover, its casual, seemingly effortless French style is evident throughout from the wide line of sight from the driver’s seat to the sophisticated fabric used in the seats. In this way, the Renault Kangoo brims with useful elements making every day convenient and enjoyable.